Master every aspect of orchestrating/managing Docker including creating a Swarm, creating services, using mounts, scheduling, scaling, resource management, rolling updates, load balancing, high availability, logging and monitoring, using multiple zones, and networking. 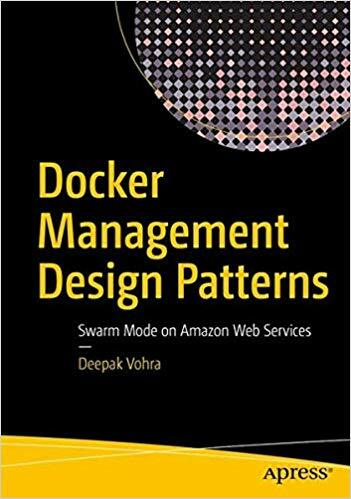 This book also discusses the managed services for Docker Swarm: Docker for AWS and Docker Cloud Swarm mode. Docker Management Design Patterns explains how to use Docker Swarm mode with Docker Engine to create a distributed Docker container cluster and how to scale a cluster of containers, schedule containers on specific nodes, and mount a volume. This book is based on the latest version of Docker (17.0x). You will learn to provision a Swarm on production-ready AWS EC2 nodes, and to link Docker Cloud to Docker for AWS to provision a new Swarm or connect to an existing Swarm. Finally, you will learn to deploy a Docker Stack on Docker Swarm with Docker Compose. Docker admins, Docker application developers, and container as a service (CAAS) developers. Some prerequisite knowledge of Linux and Docker is required. Apress Pro Docker is recommended as a companion to this book.